Maha Mrityunjaya homam is one of the name of Lord Shiva who helps to relieve from untimely death in life. This homam is also known as Maha Sanjeevani Homa/Yagna. People who worship and offers prayers to him Mrityunjaya can prevent premature deaths manner. 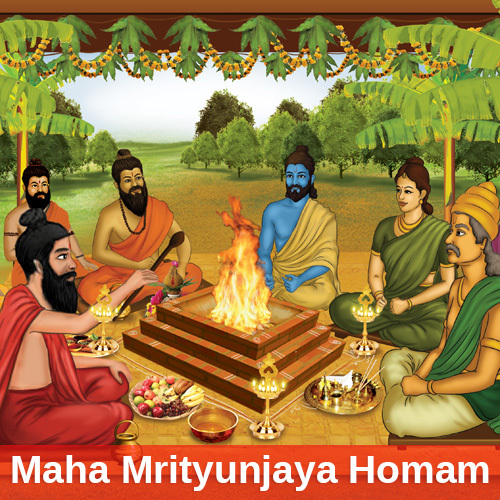 Conducting Mrityunjaya homam will lead to various goodness for a person. This function plays a major role in getting blessing and powers from three different shades of Shiva to lead a trouble free life. When To Perform Mrityunjaya Homam? This is one of the best function done during the Jenma star of the person who is suffering by dosham or the person who is having the various difficulties in his/her horoscope.